A woman at the forefront of the "yellow-vest" protest movement in France has called for a "truce" in response to a series of concessions from President Emmanuel Macron. Jacline Mouraud said protesters couldn't "spend the rest of our lives on roundabouts". Other leaders have rejected his plans. 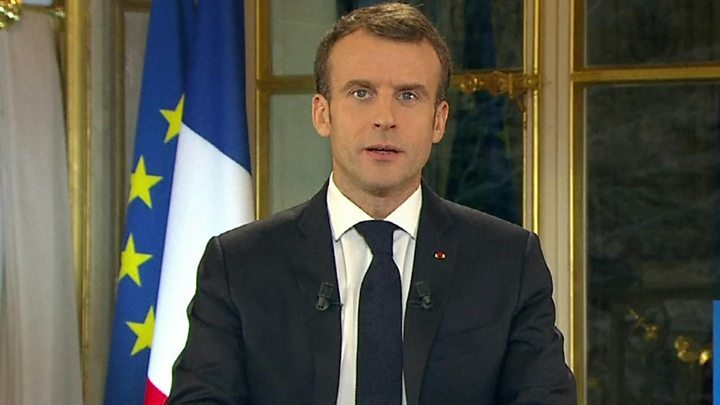 Having already scrapped a fuel tax rise, Mr Macron promised an extra €100 (£90; $114) a month for minimum wage earners and tax cuts for pensioners. France has seen four weekends of violent protests from demonstrators known as gilets jaunes - or "yellow vests" - over fuel tax rises, living costs and other issues. An opinion poll carried out in the wake of Mr Macron's speech suggested 59% of French people surveyed were unimpressed by his measures, while 40% were. Measures to defuse France's yellow-vest protests will cost €10bn (£9bn; $11bn), says Finance Minister Bruno Le Maire. That money will be offset by cuts in other government spending, he says. Mr Le Maire told British and American journalists that planned reforms remained on course despite the concessions and France would still honour deficit-to-GDP targets set by the EU. "France's attractiveness (for investors) is at stake. That is why it is so important to maintain the path of reform," he said. "We want to stick to our European commitments. We will do our best to reduce the level of public spending and be as close as possible to 3% in 2019." The biggest promise was on the minimum wage, or "Smic", and affects 2.6 million people, according to the government. Initially described as a monthly increase in the Smic, it became clear that the government instead intended to speed up a planned increase in a supplement for minimum wage earners known as an "activity premium". That way, employers would not be taxed on the income. However, President Macron refused to reinstate a tax on the wealthy, saying "this would weaken us, we need to create jobs". Other reforms to pensions, unemployment benefit and public spending would go ahead as planned, he said. Prime Minister Edouard Philippe was set to spell out the proposals to the National Assembly on Tuesday, a week after he first suspended the fuel tax rise and then scrapped it altogether. Police sources told French TV news channel BFMTV that 170 protests were still taking place on Tuesday, involving 45 road blockades and fewer than 2,000 people. The most receptive response to Mr Macron's speech came from Jacline Mouraud, 51, whose viral video complaining about fuel taxes is thought to have kick-started the yellow-vest movement. "We now have to get out of this crisis," she said. An estimated 23 million French viewers watched Mr Macron's TV appearance on Monday night. Other protest leaders were more combative. Maxime Nicolle, whose videos have been shared by protesters, said it was "too little, too late". Another key voice, Benjamin Cauchy, complained of the president's "half measures". "€100 is all very well for minimum-wage types but what's in it for all the middle-earners struggling under enormous financial pressure?" Employers' organisation Medef praised the measures, because they were focused on people's purchasing power but did not target businesses themselves. One of the president's key allies, Modem party leader Francois Bayrou, praised Mr Macron's proposals as a change of era, not merely for his presidency but in the context of the past 30 years. "You can't have economic progress without social justice, if every citizen doesn't feel involved," he said. The protesters began as a grassroots French provincial movement with people donning high-visibility yellow jackets, which by law must be carried by every vehicle in France. Anger at planned fuel tax rises then included broader issues involving families struggle to make ends meet, with calls for higher wages, lower taxes, better pensions and easier university entry requirements. Big protests in central Paris turned violent, and there are calls for a fifth Saturday of protests on 15 December.